When talking to friends and family about my decision to fly across the pond and study in Spain, the Mediterranean diet continued to surface. “Lots of fish and even more olive oil!” I kept on hearing constantly. Nobody lied about the consumption of olive oil. To put it in perspective on average Americans consume 1.1 liters of olive oil every year but Spaniards, a voluminous 10 liters. Moreover, a few family members that visited the northern part of Spain raved endlessly about the food and wine. I was eager to indulge in this foreign cuisine. 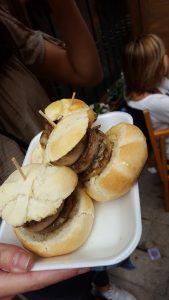 Once I arrived in Spain, I concluded that the Mediterranean diet is far greater than what you eat. It determines how one lives. The morning is often started with a cup of coffee perhaps partnered with a croissant or something sweeter. Witnessing a Spaniard dipping a churro into his/her cup of coffee always looks like the perfect way to start the day. At around 10 or 11 a mid-morning snack may be consumed to hold you over until lunch. Lunch is the meal of the day and it starts around two in the afternoon. The table stays full of laughter and buzzing well past 4:30 and on the weekends it may just carry into dinner time. 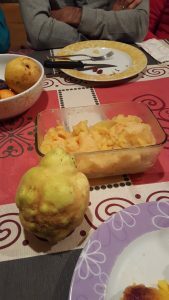 Dessert is often fresh fruit, but if you’re studying or visiting Spain try Crème Catalan if the fresh fruit isn’t satisfying your sweet tooth. The real fun begins around 8:30 pm when the famous tapas bars start to open. Every day in every district in Barcelona people eat delicious tapas while enjoying even better company. These small Spanish dishes can range from a bowl full of olives to exotic fish recipes and anything in between. Finally, dinner is around 10:00 pm and often consists of a light salad or if you are too full of tapas a piece of fruit will suffice. It is rare for me to eat on this schedule, but I have been lucky to experience it a few times with a true Spanish family. Other than eating tapas from as many tapas bars as I can find, I have found the easiest way to save money is to buy food at the grocery store or fresh produce markets. I try to cook for at least one day in advance, therefore, my time can be spent exploring or doing other activities around Barcelona. School does not allow me to eat on a true Spanish schedule, but that does not stop me from eating true Spanish cuisine. 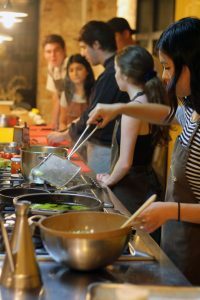 Also, this semester SAI took our program to Cook & Taste Barcelona Cooking Classes to learn to make traditional Spanish food. I highly recommend! 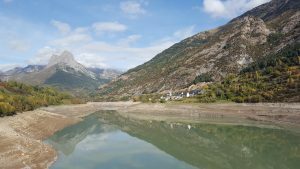 After a month into studying abroad, I spent a weekend with a Spanish family from Sabiñánigo, a small village in the autonomous community of Aragon. While spending time with my friend’s family, I learned that Spaniards prioritize being with family over everything. In the United States, my family is spread out across the west in California, Idaho, Texas, Colorado, and Montana. Therefore, seeing family even once a year is difficult. Here in Spain, that is a sin. In Spain, many people live close to family members so visiting one another throughout the week is quite convenient. 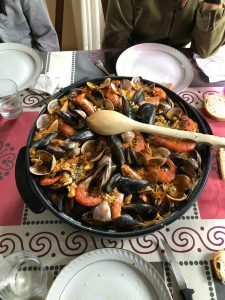 My friend’s dad made seafood paella for the whole family on my last day there and the chatter did not stop for hours. I envied the energy that my friend’s family created at the dinner table. It is one aspect of this culture I hope my future family can experience on a regular basis. I experience this feeling occasionally if my family orchestrates a big dinner on a holiday or a family reunion. After witnessing the closeness and love of this family, I have a strong ambition to see my family on a regular basis back home. Family is one of the most important things in my life and I know they will always be there for me at the end of the day. I should never take that for granted. Fun Fact: It is common and widely encouraged to live with your parents until you graduate from college. 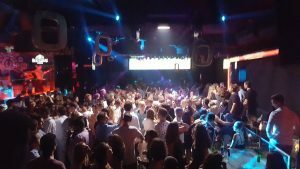 All of Spain is full of fantastic nightlife, especially Barcelona. If I am not traveling, a typical weekend night is spent dancing until around 5:00 am and sometimes later. This is followed by a leisurely walk to my favorite churro stand where my friends and I catch the metro back to our apartment. Falling asleep as the sun comes up took a little time to adjust to (I am still not fully adjusted) but it is part of the culture. Believe it or not, it is disrespectful to sleep in past 10:00 am if you are staying at a Spanish family’s house. My friend’s host mom kindly enlightened me of this social rule when I spent the weekend in Valencia. Thankfully, there is a loophole to this rule and it is called the siesta. Siestas are widely accepted and can turn a day from bad to good with a little bit of rest. The drinking culture in Spain is night and day from the drinking culture in the United States. I have never seen a Spaniard sloppy drunk and the chances are good that I never will. That being the case, thieves immediately know who the foreigners are, and they will try to target whoever is the easiest victim. But don’t let that worry you – be safe and always be aware of your surroundings. I purchased a money belt before coming to Barcelona and I do not regret then $15 purchase. It is an easy and safe way to carry around cash and identification without the worry of someone pickpocketing you. 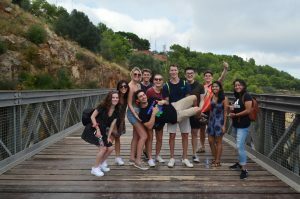 With all that being said, the long nights have still led to many unforgettable memories with friends from all over the world adapting ourselves to the Spanish culture. Gabriel is a fall 2018 SAI Barcelona student from Colorado State University.